The big news this week: Home prices continue to rise; there’s a 24% drop in completed foreclosures compared to a year ago; shadow inventory of homes likely to be sold after foreclosure declined by 35%; and the Fed will keep interest rates low at least through 2014. Data through May 2012 for the S&P/Case-Shiller Home Price Indices showed that average home prices increased by 2.2% in May over April for both the 10- and 20-City Composites. According to the report, there were 60,000 completed foreclosures in the U.S. in June 2012 compared to 80,000 in June 2011 and 60,000 in May 2012. Download a copy of the National Foreclosure Report here: www.corelogic.com/ForeclosureReport-June2012. There are roughly 5.65 million properties in this backlog now, down from 8.79 million at the beginning of 2010. 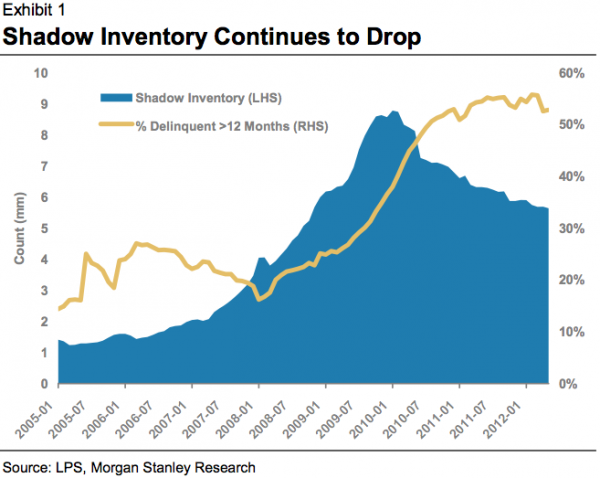 “The shadow inventory of homes likely to be sold after foreclosure declined by 35% since the peak reached two years ago, according to Morgan Stanleyresearchers. “The Federal Open Market Committee said it will keep interest rates low at least through 2014 but will not yet act on further stimulus to a slow-growing economy…. I just want to say how much I enjoy this information. You efforts putting this blog together was worth the while. Thank you for the article J.P..
I’m glad you’re enjoying the info!